For the first time The Seres Agenda brief synopsis and overview synopsis reveal what is actually coming to our planet in the near future that will transform this world beyond imagination, instead of allowing its looming destruction. Ever man, woman, and child will know without a shadow of a doubt that extraterrestrials actually exist. Before they suddenly vanished long ago from galactic history, the mysterious eighteen to twenty five feet tall human extraterrestrial Seres race seeded humankind throughout the many galaxies. Then, they sponsored the creation of the entire Galactic Inter-dimensional Alliance of Free Worlds. Now, they have finally decided to return and they will make their presence known by bringing about a permanently benevolent end to the experiment of evil on Earth. 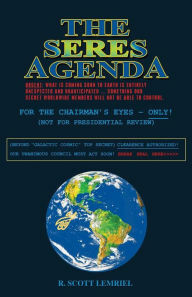 Note: It should be known that The Seres Agenda brief synopsis and overview synopsis were written for the readers benefit. They are meant to inspire each reader to further explore deliberately hidden or subconsciously suppressed truth. They begin to find out who they really are as a being, how they came to be on Earth this lifetime, and what their hidden capabilities are to comprehend the vast wondrous nature of the multidimensional universe.